Crowdfunding platform IndieGoGo has become a popular way to raise funds with a flexible goal. From creative entrepreneurs to passionate techies, people from various domains have managed to raise more than $800M through the IndieGoGo crowdfunding platform to-date. According to IndieGoGo’s 2015 statistics, “More than 2.5 million people from 226 countries and territories contributed to 175,479 campaigns, ranging from innovative technology, to creative film and entertainment, to social impact.” Running your own IndieGoGo campaign on your own can be difficult and even overwhelming at times, but it is very do-able when collaborating with one of IndieGoGo’s official partners. They can offer you professional advice from a place of experience and help you to move your project quickly from concept to production. With the help of these Indiegogo partners, you can enhance your campaign progress even further. Here are the top 6 Indiegogo partners that can make a huge difference in your crowdfunding project results. Ever since we began our platform in 2012, their aim has always been to make product discovery simple on the web. With their exclusive promotional packages and around 520K social media followers, you can surely hope to boost your campaign outreach. Find more details on the official Gadget Flow Indiegogo partner page! In order to get more pledges for your campaign, you can make use of their marketing system. Like they say, “We believe smart entrepreneurs and business owners who want to raise LOTS of money, in the crowded marketplaces of Kickstarter & Indiegogo, must become master marketers, sales experts, and direct response gurus.” Find more details on the official Funded Today Indiegogo partner page! The team behind RainFactory Inc. mixes the right combination of research, experience design, execution, testing, and reiteration to ensure you and your products reach maximum potential. Find more details on the official Rain Factory Indiegogo partner page! They offer an easy way to publish, share and embed interactive 3D content, anywhere online. You can easily embed their 3D viewer on your website and on Indiegogo, just as easily as a YouTube video. Find more details on the Sketchfab Indiegogo partner page! From developing custom branding and graphics, to SEO plans, to social media marketing, the Ignite agency is a full-service professional crowdfunding marketing agency for creating and promoting kickstarter and indiegogo crowdfunding campaigns. They use a proprietary 200+ step process that encompasses the entire process for creating a successful campaign. From concept to completion – they do it all, video, content writing, rewards development, fundraising guidance, social media development and marketing, PR, website development, and campaign support before as well as during the campaign period. Find more details on the official Ignite Agency IdieGoGo partner page! A very useful platform for the hardware manufacturers which will enable you to manage product development, connect with manufacturing and supply chain industry experts. That way, you’ll be able to bring your project to the market, faster! Find more details on the official HW Trek Indiegogo partner page! We hope that these official IndieGoGo partners will have something to offer your project or even inspire you to step up your campaign marketing efforts! This article is sponsored by The Gadget Flow. Their product discovery platform has 6 million monthly visitors, 100,000+ subscribers, and they have helped over 3000 customers with promotion thus far. Visit thegadgetflow.com/submit and list your project today. Founder and CEO at Gadget Flow Inc, Evan Varsamis is an entrepreneur, Investor at Qrator and Comet Core, and he was named “Global Citizen” by American Express. 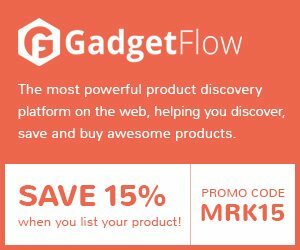 Get 15% off using the CrowdfundingHeadlines.com exclusive coupon code MRK15 when listing your product or crowdfunding campaign on TheGadgetFlow!